With the rapid changes in our understanding of the ‘what’, ‘why’, ‘where’ and ‘how’ of relational trauma arising from the recent advances in neuroscience, (The Brain that Changes Itself, N Doidge, 2007) the psychologist’s, psychotherapist’s and psychiatrist’s capacities to deeply engage with and deliver effective treatments (The Trauma Treatment Handbook, R Shapiro, 2010, The Science of the Art of Psychotherapy, A Schore, 2012) to both civilian and military survivors and veterans of trauma are being greatly enhanced. My particular focus in today’s presentation is based on personal and professional experiences dealing with the manifestations of Holocaust trauma across the generations – survivors, second and third generations. I reference the vast Holocaust Testimony Archives (Yale, VHF, Washington, Yad Vashem, Melbourne Holocuast Centre and others). These archives provide information and unique data for research, not only on the impact of trauma on the veterans, but also on their next of kin, second and third generation survivors. My overview will update the exciting and rapidly advancing fields of neuroscience and neuroplasticity as I examine some practical implications for the psychological care across the life span, from the newborn at risk for transmission of trauma, through the life-cycle of young adulthood, at risk for being misdiagnosed as ADHD, anxiety, depression and many regulation disorders, to the complex psychological care issues faced by the aging veteran, especially in residential care settings (http://kavod.claimscon.org (Halasz, Kaplan & Myer, 2013), and for their for caregivers and families (www.projectwitness.org) Out of Sight/ In Plain View (Halasz, 2013). If we are not aware of the manifestations of psychological trauma and dissociation, if we remain illiterate in ”traumatic symptoms,” we are unlikely to make accurate assessments of our own symptoms, or others, of a range of conditions that include PTSD. The unintended clinical consequences of such ”traumatic illiteracy” include prescribed treatments that are inappropriate at best, and may have their own serious side-effects. Because of the phenomenon of “enactments,” which I’ll explain in a moment, I will add a personal dimension on the psychological therapy with survivors, to include next-of-kin, who, like myself, are also witnesses, even as we live our lives in families with survivors. In my case, the manifestations of Holocaust trauma that I witness as “‘enactments” reveal specific patterns of experiences that repeatedly amaze me, equally in my clinical work as in my family relationships, as I trace their origins to relational trauma from my own childhood. 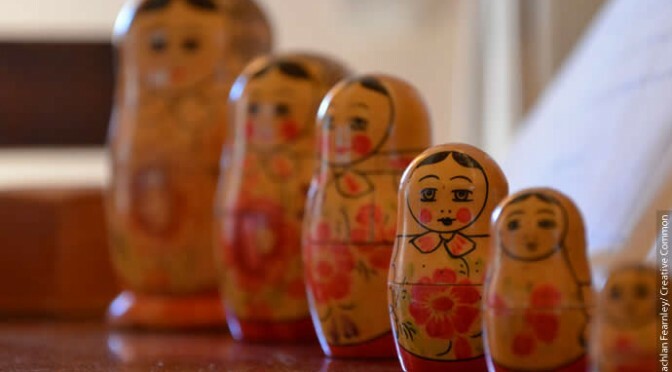 To explain briefly, I’ll make use of Allan Schore’s (2013) ”Russian Doll” model – to be detailed – as a way to understand the 3 layers of our brain function that provide the neurological basis for understanding relational trauma and dissociations. 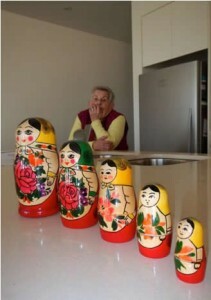 I will demonstrate with the Matryoshkas as a visual model of the moment of relational trauma and its transfer between the generations. Her question stunned me. I swallowed deeply and took a few breaths, wondering how I would answer her as I was arranging the five dolls. I do not recall how many seconds passed. It seemed like an eternity. I had cycles enough already to deal with. 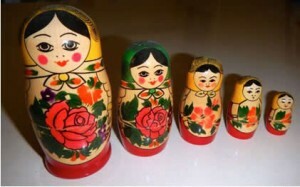 I decided instinctively to use the Matryoshka dolls to talk the talk. I now needed to walk the walk! I started to explain. The dolls that are the three-in-a-row represent the mother’s brain and nervous system inside her, the youngest parts to the oldest parts. Likewise, the two-in-a-row dolls facing her represent the baby-child with his two young parts. Now, as they relate with each other the baby and mother face each other. Sometimes the mother, who is a survivor who had to disconnect from her terrible experiences to survive her trauma, had to learn to be detached or disconnected if she was to survive the Holocaust trauma. I proceeded to place the dolls apart some distance to represent how the inner parts are dissociated or disconnected. I went on to explain further that if the baby needs something from the mother at the time that she, the mother, is disconnected, then the baby, not knowing the mother is unavailable, becomes distressed. If that distress intensifies too much, the baby also disconnects. The baby’s delicate and developing nervous system cannot tolerate the level of increasing stresses and so he dissociates also. In passing, I note that this process is something like the mirroring, which I observed in myself using the split screen video studies (2000-2004). I now placed a distance between the two baby dolls representing this dissociation and how after this moment the baby is no longer able to feel any distress. Instead, his dissociated state protects him, as a psychological defense, against the pain of frustration and stress. 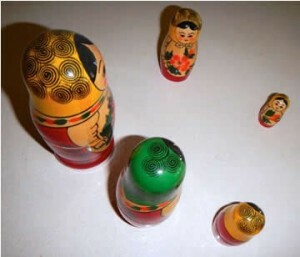 Now, with these Matryoshkas in front of us both, we became witnesses to their playful enactments. 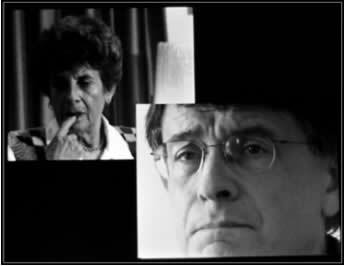 It was sort of a play therapy session for my mother and I.
I explained that if these patterns of dissociations were sustained without reparative moments, being repeated – enactments – the baby will be at risk to lose his sense of desire and vitality affects, as well as fragment his identity (see D. Stern). I later thought to myself as I was writing this section that while the baby may feel many feelings, such as stress, rage, anxiety, and panic attacks, these moments of necessary dissociations also become, at the same time, the seeds for later problems in attention and concentration. If these antecedents are not kept in mind then the secondary depression, which can occur later in life, may be inadequately treated if these primary problems, set up in infancy as trauma that was transmitted, are not recognized as later enactments. That is a more complex story we can discuss later. In the past, many of our professional ideas in psychology arose from clinical experiences and we expressed our belief in the capacity for survivors to forge new, fulfilling, inspirational and dynamic paths in their life. In the current era, with the evidence from neuroscience of trauma, I have found that belief to become less and less an act of faith, and over the last decade, I have come to see more and more the facts of Holocaust as relational trauma, which I can observe and witness. As the manifestations of psychological trauma are being revealed, so they also become available to be repaired. The specific manifestations I refer to in relational trauma are not what we’d expect. The moment of trauma is so overwhelming, and too much to bear that the body actually switches into a different state called survival mode to survive the impact of the trauma. In everyday language, these are the “fight,” “flight” and “freeze” reactions with their classic manifestations well known to all students of first-aid. We make sure the person has a clear airway and can breathe, has a pulse and is not bleeding. But what is not so obvious yet as part and parcel of this traumatic moment is the dissociation that is part of extreme stress and trauma. The traumatized person will, at best, say that they have no memory for a specific phase of their life, which usually is timed just before the traumatic event. In the past, I merely saw, heard, or felt these dissociations that I had lived through. But, as the years have passed, I am painstakingly learning now that I need to pay special attention to my disconnections that I now witness in myself. This witnessing is a totally different experience, as I will explain. Witnessing, as detailed in my chapter in Nancy and Marilyn’s book, The Power of Witnessing (2012), is a profound act of the deepest engagement with another’s experience. It surpasses sympathy or attunement or even empathy, although they are all part of it. Psychological witnessing demands a visceral resonance at the level of body language (right brain), not just spoken language of emotion (left brain). In my experiences with my mother’s emotional states, as with my own and my patients’ emotional states, I, as a psychotherapist, have learned to witness these moments of deep visceral engagement at the level of witnessing through our body’s language. To explain, the body (right brain) language is as developed as our verbal language. We are all aware how we raise our voice to emphasize a point, or use hand gestures to get a message across with more force, but there are many more subtle signals from our body, even stomach rumbles can tell a great deal, as can a shake of the head, or a deep sigh. Over the years, I tended to learn more to resonate with facial expressions, prosody – the music of the voice – body, hand and facial gestures and the rhythm of breathing than with the spoken words. This body language is a universal language spoken by psychological trauma, from infants, children to adults through to old age. To witness the body language reveals the myriad manifestations of relational trauma, and in those manifestations is the potential to offer the antidote, the reparative moments. This transformation from my illiteracy of trauma to the expression of trauma’s own body language is a process that is on-going. The many contributors to Nancy and Marilyn’s, The Power of Witnessing (2012), offer inspiring examples of reparative moments to Holocaust trauma in the survivors and next of kin through art, poetry, music, writing, photography and other dynamic and creative pathways. If one wishes to see the manifestations of the power of witnessing, it is in plain view in the moving images as much, or even more, than the words. The psychological witness will look between the lines, in the reflections, reverberations and the traces expressed in the verbal and visual testimony from the living minds of all survivors – the challenge for us is to see those manifestations. Sometimes the power of those manifestations renders us emotionally blind, even when they are in plain sight, awaiting a witness. I would like to express my gratitude to Alice Halasz for her continued support, encouragement and insights that I have been exploring into the nature of Holocaust relational trauma and repair.